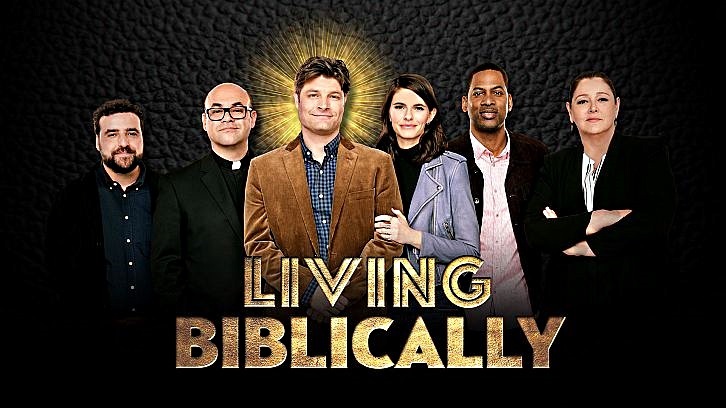 "Pilot" - Chip Curry (Jay R. Ferguson) is a modern-day man at a crossroads in his life who decides to live strictly in accordance with the Bible, on the series premiere of the new comedy LIVING BIBLICALLY, Monday, Feb. 26 (9:30-10:00 PM, ET/PT) on the CBS Television Network. The new series stars Jay R. Ferguson, Lindsey Kraft, Ian Gomez, David Krumholtz, Tony Rock and Camryn Manheim. A film critic for a New York newspaper and a soon-to-be father, Chip wants to be a better man following the loss of his best friend. He decides to put his slightly obsessive temperament to use and start living his life 100% by the Bible to find direction. His smart, pregnant wife, Leslie, while both skeptical and entertained by her husband's new passion, supports him completely. Knowing he'll need some practical advice, Chip forms a "God Squad" with Father Gene, a Catholic priest who helps Chip translate the rules of the Bible to a modern world, and Father Gene's best friend, easygoing Rabbi Gil Ableman, who respects Chip's chutzpah and is glad to serve as a sounding board when they meet at their local bar. At Chip's newspaper, he finds support from his no-nonsense boss, Ms. Meadows, who knows Chip's self-penned story will sell newspapers, and his co-worker and friend, Vince, who is quick with a reality check and likes to wind Chip up for his own amusement. As he begins his sincere spiritual journey toward a more moral life with the help of his wife and friends, Chip wonders if he'll be able to take a page - or every page - out of the Good Book, and if the effect will be of biblical proportions.